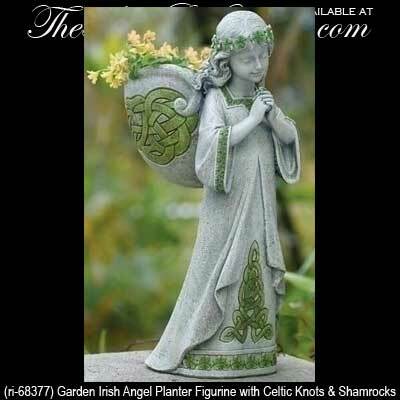 This Irish angel statue is also a planter for your garden. This Irish angel statue has a bouquet of shamrocks in her hands that are folded in prayer and she is also features a planter on her back. The praying Irish angel offers great detail with a dimensional design that is enhanced with a shamrock laurel on her head and additional shamrocks on her gown. There are also green Celtic knots on her gown along with the planter that is complete with a drain hole. The Irish garden angel is made of a stone and resin mix and measures 9" wide x 15" tall x 6 1/2" deep. The Irish garden decor is gift boxed with shamrock and Celtic knot history cards, complements of The Irish Gift House.